There’s been a lot of talk, lately, of the Audi R8 and the fact that it won’t be making it past this model generation. Following the second-gen R8, Audi will axe the model altogether, thanks to its high-cost, low sales volume and the need to increase the brand’s overall fuel efficiency. However, that doesn’t mean the R8 won’t go down swinging, as it turns out that Audi will, after all, be introducing an entry-level R8. As being reported by Autocar, the post-facelift Audi R8 will have an entry-level variant and it will sport the same 2.9 liter twin-turbocharged V6 found in the Audi RS5. This replaces the Audi R8 V8 of the first-gen car, something the second-gen car never had. And it’s good news, as many enthusiasts actually prefer the V8 version of the older car (this enthusiast included), as it was lighter, better balanced and considerably cheaper. This new 2.9 liter twin-turbocharged V6 is the same one found in most new Audi Sport models and was developed in-joint by Audi and Porsche. It’s also the same engine used in the Porsche Panamera. In Audi RS5 form, the new twin-turbo V6 makes 450 hp and 443 lb-ft of torque. Though, Autocar is reporting that it could make over 500 hp and 500 lb-ft of torque in R8-guise. That’s actually more torque than the Audi R8 V10 Plus, so it’s possible that it could accelerate to 60 mph even quicker than the V10-powered model. 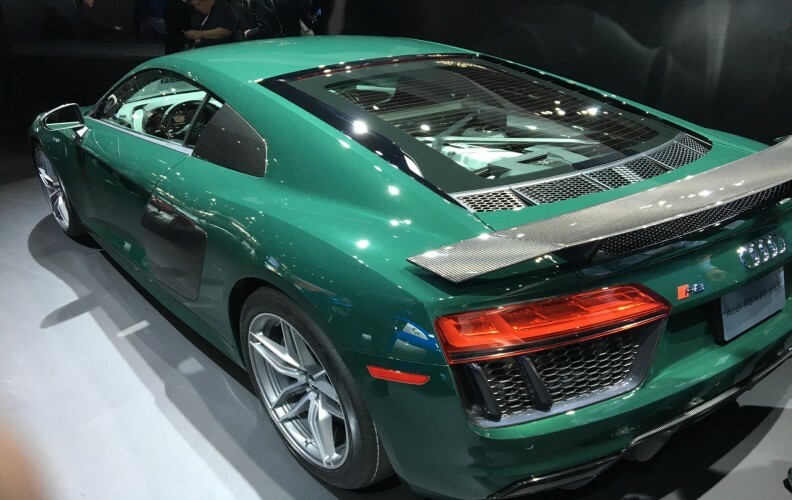 Audi will sell the Audi R8 V6 with two different power outputs, likely a standard and a “Plus” variant. Expect the standard model to make about as much power as the RS5 but the Audi R8 V6 Plus to have around 500 hp. There’s no word on whether or not there will be a RWS (Rear-Wheel Series) version of the Audi R8 V6 but, to be honest, if there were a version of the R8 that would benefit most from being rear-wheel drive, it’s the V6 version. The lighter weight and less power would make it a seriously fun car to drive. We’re very excited about the prospect of an Audi R8 V6. Lighter weight, better balance and turbocharged punch should make it a ton of fun. Sure, it will lose that naturally-aspirated V10 scream and the whiff of exotic supercar, but it should be a very fun car to drive. Plus, it should be far more affordable, likely along the same price point as the Porsche 911 Carrera.